In Uganda, particularly rural Uganda, women, and girls receive inadequate access to sexual reproductive health and rights (SRHR). There are high rates of maternal mortality, perinatal mortality, unmet needs for family planning, and access to contraception is poor. 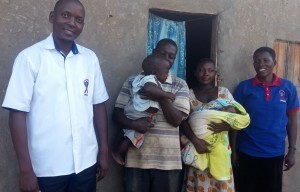 A project, delivered by PREFA (Protecting Families Against HIV/AIDS), a Ugandan NGO, with funding from UK Aid Direct, has been challenging the status quo in the Kalungu district of Uganda. From delivering health education, family planning, antenatal services, health facility deliveries, and emergency obstetric care, with adolescents and young women as the prime beneficiaries, PREFA has done a lot to support SRHR services in this region. The project also teaches health workers to provide professional and friendly health services, inspiring communities to practice healthy behaviours and as a direct result of this project, gone are the days here when men and women are abused at health facilities; women are no longer being slapped when trying to deliver a baby, and men are no longer being refused entry into the labour wards. One of the beneficiaries of this project was NJ; NJ is a 24-year-old housewife married to SV, a farmer and resident of Kanyogoga, Lwabenge Sub County. When NJ realised she had conceived just 3 months after giving birth to their second child, she was concerned about their low income, and the welfare of her husband, who had recently been hospitalised. NJ contemplated having an abortion (an illegal procedure in Uganda for a mother who is well). NJ contacted St. Monica-Birongo HC III – a private, not-for-profit health facility located 6 kilometres away from her home, to see if she could secure a termination. This health facility, complete with a youth centre, is supported by PREFA and NJ was offered counselling services by the medical staff and was also informed that she was eligible for enrolment on the transport voucher program. On NJ’s second visit to the youth centre, she said she had changed her mind on terminating the pregnancy. She enrolled on the voucher program and so was able to attend all 4 of the recommended antenatal clinic visits. Typically, this target is achieved by just 47.6% of mothers in this region. After attending the antenatal visits, NJ was referred to Masaka, a regional referral hospital located around 48 kilometres away from St. Monica Birongo HC III for her delivery, as she had a scar from a previous birth. NJ delivered a healthy baby girl by Caesarian section and was discharged from Masaka two weeks later. Community officers and community resource staff, supported by PREFA, visited NJ and her baby at their home, and both were doing well. 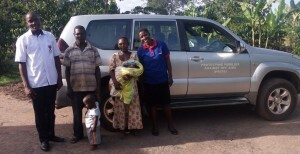 NJ was encouraged to attend postnatal visits at St. Monica Birongo HC III and she and her husband were counselled on the benefits of family planning, and both consented to have a long-term reversible procedure. Thank you to PREFA for sharing this story with us.